Since graduating from Calvin in 2004, I have worked as a pediatric nurse. My profession took on personal significance in 2015 when a non-invasive prenatal screening test indicated that our daughter would likely be born with Down syndrome. While both my husband, Aaron, and I had encountered people with Down syndrome through our work as a nurse and an educator, neither of us had a vision of what daily family life would be like with a child with Down syndrome. We mourned the loss of the vision of the child we had expected. We had a few sad weeks thinking that our vision of our future was gone, knowing we could be caring for her the rest of our lives. I responded to the unknown by diving into research, reading books and blog posts, meeting with doctors and other families, and scouring the internet. My journey into the world of parenting a child with Down syndrome has been life altering, partly as I wrestled with what it means to be “fearfully and wonderfully made” and what the world defines as “a genetic defect." In the span of a few generations, two aspects of Down syndrome have been transitioning. We are moving away from a diagnosis at birth toward a prenatal diagnosis and away from institutionalizing many individuals and toward equipping people with Down syndrome to be productive members of an increasingly inclusive society. 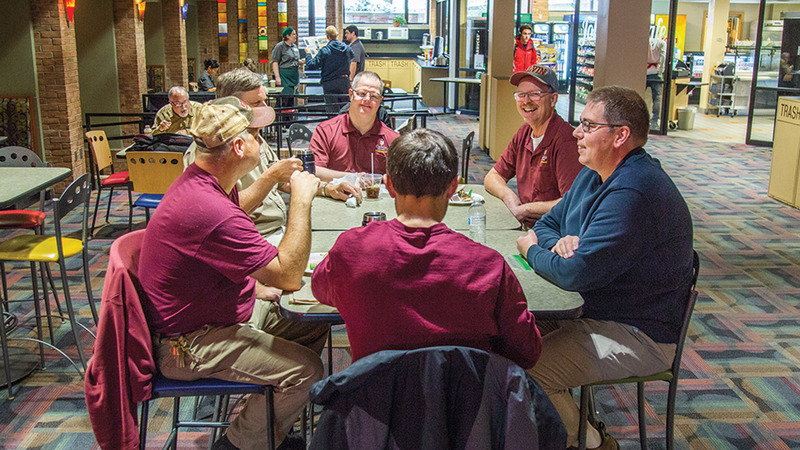 In the United States, increased awareness and social action have furthered the push toward a more inclusive society for people with intellectual and developmental disabilities. This has resulted in some state-level laws attempting to address the ethical and moral issues created by the recent availability of more accurate prenatal testing. In Europe, there is increasing pressure to terminate pregnancies that screen positively for Down syndrome to reduce the so-called “burden on society.” England recently made the non-invasive prenatal testing available free for every pregnancy, and its current termination rate for those who receive a positive result is 90 percent. In Iceland, testing is almost universal, and termination of those pregnancies is also almost universal, with an average of only one to two children born with Down syndrome every year. The dramatic shifts in attitudes and practices over time and between countries have left many families and medical providers uncertain about the best practices related to delivering a Down syndrome diagnosis. Sometimes families must deal with providers who have outdated perceptions and information about Down syndrome, which can lead to a traumatic diagnosis experience for the family. overwhelming list of possible medical complications and challenges their child could face over a lifetime at the time of diagnosis. While it is important to discuss the possibility of medical problems associated with Down syndrome, it is also important to deliver information in an unbiased and balanced way that allows families to process the news. Hearing these stories, I felt sad for both the families and the providers who lacked resources to give the best care. So in the past year, I’ve become co-director of medical outreach for the Down Syndrome Diagnostic Network (DSDN), which gives me a chance to connect providers with resources and support that will help them deliver Down syndrome diagnoses. We were blessed to have a medical team that didn’t negatively frame Down syndrome during our diagnosis. I have met so many families through DSDN who did not have that experience. They received outdated information about Down syndrome and felt that medical providers pushed for certain options and decisions. The non-invasive prenatal screening test we received for Juliana is a newer technology that has been around since 2011. This technology checks the DNA of the fetus by looking for fragments of it in the mother’s bloodstream. By examining the DNA of a fetus without the invasiveness and risks of procedures such as amniocentesis, these tests can be highly sensitive while not diagnostic, which can create confusion for both the family and the health care provider. Some families pursue further testing while others make the same choice we did: They treat the positive screen as a diagnosis and wait until after birth to have further diagnostic testing. Soon after we received Juliana’s positive screening result, I connected with both our local and national Down syndrome networks. DSDN focuses on supporting families in the early years of having a child with Down syndrome, providing private online support groups for parents and offering information and resources for medical professionals and their patients. DSDN’s goal has always been that each family receives the diagnosis in an unbiased way, is offered accurate and up-to-date information about Down syndrome, and is connected to a support group. We have also been working with the companies that do the testing, educating them about how test results are received and used by providers and families. We reach out to physicians to increase their awareness of guidelines for delivering the diagnosis and of resources available to families. It was an amazing gift to me during the prenatal period to have a peer group such as the one I found in DSDN, where my pregnancy and feelings were normal. I’ve continued to walk through raising Juliana with the same group of mothers. I can’t imagine being on this journey without this place to celebrate Juliana and process through the rough spots with other parents who understand. 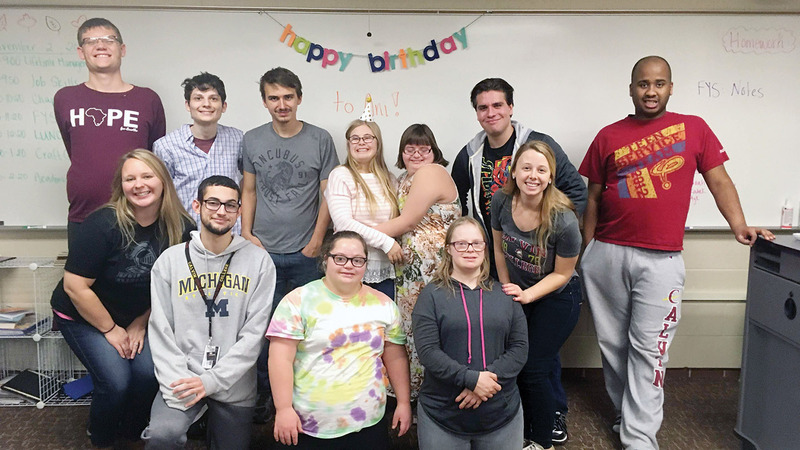 “It’s good to know about the environment around you, and find out where you stand out in the world,” said Katie Kauffman, a Calvin student with Down syndrome, about the Ready For Life (RFL) program. students audit two college courses each semester along with fellow Calvin and Hope students. In addition, a certified special education instructor teaches life-skills classes, such as budgeting and lifetime management. Additionally, many RFL students take advantage of the wide array of activities Calvin has to offer and take part in everything from attending sports games to participating in Dance Guild. RFL students also have the opportunity to develop relationships with other students on campus. Each semester college students volunteer as mentors to RFL students, inside and outside of the classroom. The program has grown significantly in the last few years. “When we started in January 2017, we had only two students, our second year there were five, and now we have 11,” said Amber Gilliland, the RFL teacher on Calvin’s campus. In addition, the program has become more well-known and supported on campus by students and professors. There are about 65 students who volunteer as mentors for the program, whether in their Calvin class, in their dorm, or by visiting the RFL classroom. Your life changes automatically when you have a child, but having Juliana has changed our life a bit more than usual. We accommodate six therapy appointments weekly and are members of new communities both locally and virtually. However, the biggest shift has been in our worldview and priorities. Our goals for our son are vague, and we are more focused on the next year or two. With Juliana, we are forced to think about 10 to 20 years from now and then work backward to what we need to be doing today to progress toward that goal. One example in our lives: Our family learned sign language. Speech is typically delayed in children with Down syndrome due to low muscle tone. In an effort to increase Juliana’s ability to communicate, we started to learn sign language during her infant years to enhance her overall communication as a toddler. Juliana’s language access is vital to learning other complex concepts during these important developmental years. While we have concrete goals for both of our kids, we also have realized the greater importance of less tangible goals. I want both of my kids to learn to collaborate on a team, to work hard for something and accomplish it, to be kind and inclusive in their life, and to find contentment within the life and challenges they have been given. In our family, those are more important practices than good grades or athletic abilities. The moment when you hear there is something “wrong” with your child is a moment you never forget. I froze when I answered the phone and the genetic counselor said, “I didn’t prepare you for this, but the test showed she has Down syndrome.” I don’t remember much more of the initial conversation, but both the genetic counselor and my midwife followed up with us numerous times those first few days to answer our questions as we thought of them, connect us to resources as we were ready, and reassure us we were going to be OK.
Every parent who has a child with Down syndrome also has a diagnosis story—and all the health care providers I meet through DSDN need to know the importance of those first spoken words. That diagnosis conversation is the art of medicine, occurring at a moment that will change the course of a family’s life. My time at Calvin taught me that part of my vocation is to consider where God has placed me and work to redeem my square inch. God gave me a heart for nursing and a child with Down syndrome, and the diagnosis conversation is the square inch I am working on. Step into Calvin’s physical plant building most any weekday and you’re bound to find Tim Bolt behind the handle of a vacuum cleaner or with a bucket in hand. Bolt’s been a staple on the staff at the physical plant for longer than almost everyone else working there. “He’s been around so long, I can’t imagine the place without him,” said Keith VanKooten, another longtimer on the plant staff. at making people smile. “Just sitting here talking about him makes my day better,” said Jennifer Ambrose, one of Bolt’s co-workers. importantly, he teaches people about Down syndrome and inclusivity. Turns out Bolt also has another gift: he offers perspective. “He helps us, for a few seconds, step out of the busyness of life,” said Moore. Bolt also has been a teacher to many Calvin students who have worked in the physical plant. Hannah Steensma Leunk Pascucci ’04 is a pediatric nurse at Golisano Children’s Hospital in Rochester, New York, where she lives with her husband, Aaron, and children, Caden and Juliana. What do we want Calvin to look like by 2030? Early assurance programs offer pre-med students placement and peace of mind. Adopted daughter and family recount journey of bravery.